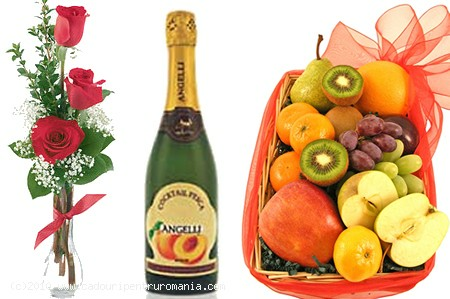 What else could she wish for other than fiery red roses, fresh fruits and champagne? 1. Send Gifts To Romania quality guarantee: Send Gifts To Romania offers flower delivery to Romania at the highest standards: all flowers are fresh, picked manually and wrapped elegantly. 2. About flower delivery to Romania: Send Gifts To Romania offers flower delivery to Romania Monday through Saturday. For all Sunday flower deliveries to Romania, please contact us in advance. 3. Scheduling a flower delivery to Romania with Send Gifts To Romania: All flower deliveries need to be scheduled 48 hours in advance. For example, if you would like to schedule a flower delivery to Romania on a Thursday, the order need to be placed on our online gift store Tuesday before 2.00 pm the latest. 4. Send Gifts To Romania gift and flower wrapping: all gifts are beautifully wrapped and accompanied by gorgeous luxurious ribbons or other gift accessories; each and every flower bouquet is individually checked for imperfections so that each flower delivery makes a breathtaking surprise.